An exciting new series of posts begins! 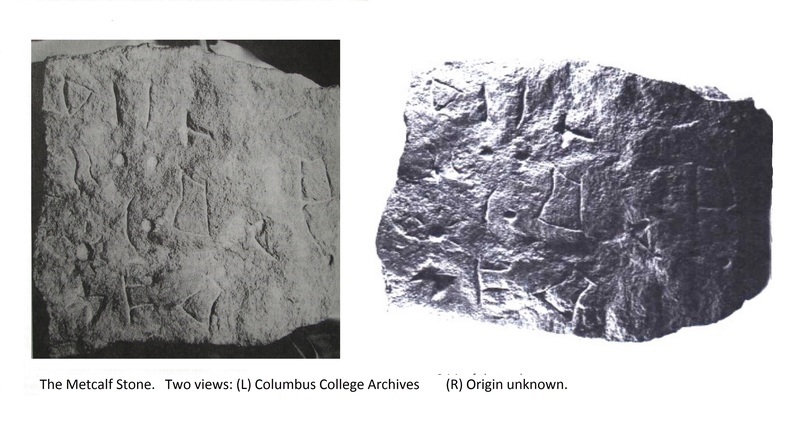 New translations of ancient North American Stones ….. The Metcalf Stone is a unique and important discovery. It was found by Manfred Metcalf in 1967 at Fort Benning outside Columbus, Georgia. This eleven by eleven inch stone was part of a chimney foundation from a house built prior to 1889 eliminating the idea of a recent forgery. Several individuals believe the symbols are Linear A. But some symbols do not fit the script so it is, as of yet, unread. There are twelve symbols on the stone composed of sixteen components. This is significant. Twelve indicates the number of months in the year and the number of signs in the zodiac. Sixteen reminds us that the Earth travels 1600,000 miles in any given day. Counting punch marks from far right to left moving upwards we find 1,1, and 3 which creates the number 113. This is 2 x 56.5. Or count them as 2, 3 or 3, 2. This 23 – 32 was significant at Newark and on the Aberlemno Stone from Scotland. Indeed, counting the placement of the symbols, there are four in the first column and three in the second giving us 43 which is half 86. The diameter of the sun is 864,000 miles. The remaining columns must be read left to right to give 1,1,3 or 113. This is 2 x 56.5 which is a reiteration of the 56.5 above. This number was seen in the Newark Decalogue Stone. Continuing along this line from left to right is 1 and 1 or 11 which often indicates the infinity of God. Returning, moving right to left, the remaining columns then count 3, 3, 4 symbols. This creates 33.4 which is significant as we saw in the Newark Earthworks and the Norrie’s Law medallion also from Scotland. This method of item counts with punches is identical to what was found on the 5,000 year old Knowth and Newgrange Kerb Stones from Ireland giving one a good idea of when and by whom these stone documents were inscribed. Understanding the double triangle symbol. Three of the symbols can be easily identified as mathematical symbols. Note the symbols for parallel lines, a bent angle and an angle. The bottom left symbol is very similar to the letter quo in Phoenician during the 7th to 1st century B.C. Prior to that in 1000 B.C. it was depicted as a circle with a stick out of its center to the bottom which is more stylized in a modern Q. Today, in engineering discussions, a ball on top of a stick is used to symbolize a structure and how it moves. This double triangle symbol was a Z in South Semitic scripts in 1000 B.C. The Phoenician symbol for Z in that time period looked more like a capital I. 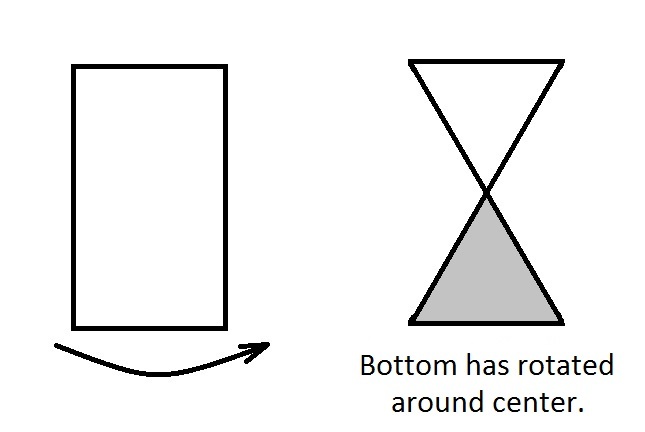 We can understand this symbol by seeing it as a rectangle that has twisted like a bag-twisty. The left top symbol is not a triangle but a dagger or sword which is easily identified in other art from the pre-Christ era. The two symbols in the third column are animal skins. Archaeologists have wondered why copper ingots were cast in this shape. Here then we have an answer. Copper is cast in the shape of a skin in remembrance of the comet, composed of copper, which moved the skin of the Earth. The symbol on the far right. The most interesting symbol on the piece is on the right hand side made of the square and the downward stroke ending in a punch mark. Comparison with the constellation Ursa Minor quickly proves it is not exactly this star cluster. 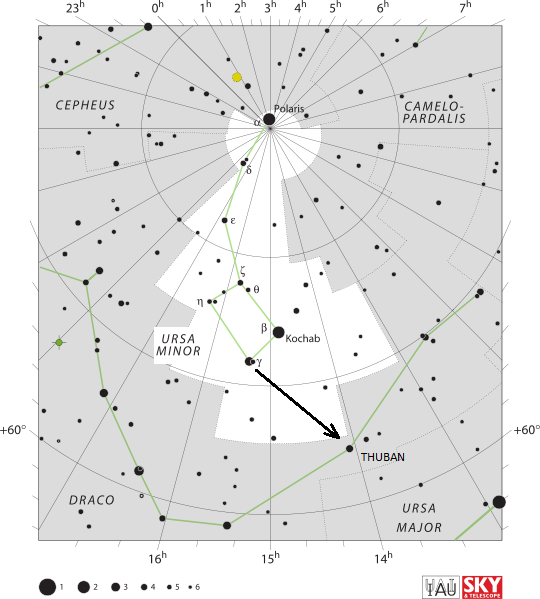 Comparison of the layout with a star map shows that the pole star from 4000 BC to 1800 BC, Thuban, is being indicated which gives us a reference for the time period to which the stone relates, was first written, or it is just a mirror image of Ursa Minor and so a simple reference to the pole star. The translation is thus read from top left downwards in columns towards the right except for the bottom row which reads left to right for two symbols. 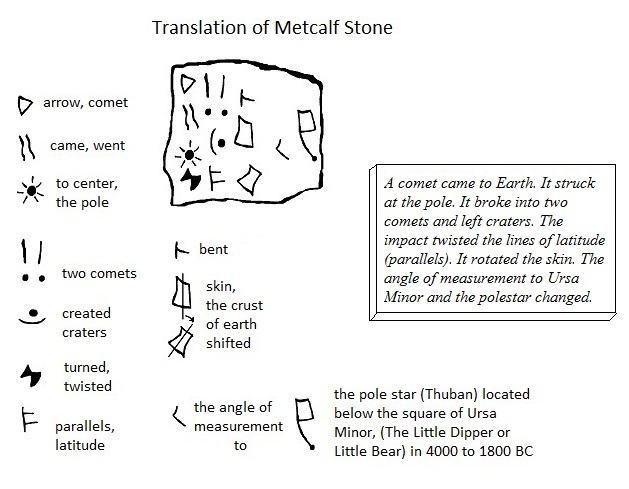 So then, there is enough information to translate this stone as shown in the last diagram. A comet came to Earth. It struck at the pole. In the coming months the Ohio Tablets, Gridley Stone, Hopewell Shaman Statue, and Ohio Adena Pipe will be studied. They are fabulous ancient art each with an extraordinary message to tell. Egyptian Art Comparison and the Cincinnati Tablet. This entry was posted in American History, Ancient History, Mysteries, Native American, Science and tagged American Indian, Artifact Georgia, Engraved Stone, Metcalf Stone, Neolithic art interpretation.